A Hydro Instruments chlorinator/sulfonator system feeding a pipe line using a centrifugal pump. 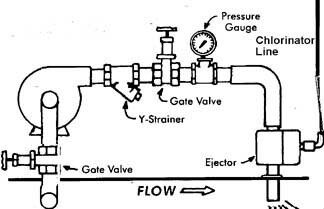 Note the location of gate valves for easy Y-strainer cleaning and practical pump maintenance. NOTE: The pump suction should be 5 feet away from the ejector injection point. On larger pipe diameters of 6 inches or greater, a distance of 10 times the pipe diameter should be maintained so that chlorinated water is not recirculated through the booster pump.